Since I retired, my HDL (Honey Do list) has grown to the point where Peggy suggested that I write it down somewhere that I can always get to it, so I'm in the process of adding my Honey Do list to the blog site. I guess that's another item for the list! One list item was to replace the master bedroom door, it's the last hall door to replace with a nice varnished door to match the others. Of course I needed a few tools to do it and make a nice job, including a spatula to smooth out the filler that I used to clean up some of the older screw holes in the door frame. I have a whole set of spatulas, but could not find one anywhere. So I recalled the last time I used one. AhHa! I was working on varnishing the teak around the boat Companionway, so they must be on the boat. Sorry honey! 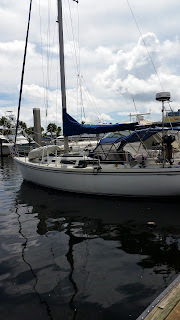 It will have to wait till I get back down the boat and pickup my spatulas that I used while refinishing the tea around the Companionway. It might be winter, but the grass still grows down here in South Florida. I lent my mower to a neighbor as his had broken. "Don't forget to check the Blade" was Peggy's response when I got the mower back. It's not that long since I checked the blade and then thought it was fine, but now it really does need a sharpen. Time to get out my trusty Angle Grinder, Oh! It's on the boat! "Why don't you get another one so that you have one at home too?" Good idea. Off I got to Harbor Freight and find the latest model that uses the same size cutting disks. Now sometimes I screw up, honest! The last time I was at the boat I replaced the Engine Stop cable which had seized solid. The new cable was about 3' too long and the only way to cut it neatly is to use an angle grinder, and I have 2 of them. What did I screw up? I brought the second one home last week with a bunch of other tools. Peggy had requested that I cut back on the number of tools on the boat, so I brought a whole crate load home - including the 2nd angle grinder. We keep the documentation for the boat in a satchel so that we can take it with us when we go away for a trip on the boat. You might be surprised how much stuff there it to have aboard. Not just the boat documentation, but the instrument manuals, owners manuals, etc. So the bag concept works great, well, that's great if you take it home. So when Peggy asked me about a function on the GPS - at home - at breakfast time, I had to reply - It's on the Boat! I'm sure other sailors have a list of things they left on the boat and needed at home or worse, left at home when needed on the boat! Perhaps I should build a list of what's On the Boat! Another task for the Honey Do List. Give the outboard the old heave ho.